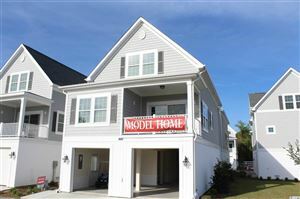 Waterfall is an elegant, gated community in Little River, SC, that is set apart from other subdivisions. Waterfall welcomes residents with an impressive private, gated entry and magnificent community center. The centerpiece of the community is the beautiful 8.5 acre Tranquility Lake. Other amenities include biking and walking lanes incorporated into Waterfall‘s streets. The Community Center features a large swimming pool, outdoor kitchen, and meeting area for homeowner gatherings and family events. You will also notice artistically designed street signs, elegant street lamps and custom mailboxes, all designed to make Waterfall a spectacular neighborhood. Waterfall welcomes you to a premier new community in the North Myrtle Beach, SC area, featuring many innovative concepts and ideas designed to set it apart from all other housing subdivisions. Every home has a water feature; that water feature might be a fountain, a mini-waterfall, a pond, or a lake! Located only 5 minutes from the beach,Waterfall is a place where you can be proud to invite family and friends! RE/MAX Southern Shores agents sell Waterfall and Little River real estate! RE/MAX Southern Shores agents are experts who know and sell properties in the Little River communities. RE/MAX Southern Shores agents are the #1 selling agents in the entire Grand Strand area, so they will be able to find exactly the RIGHT property for you at the RIGHT price. Using the RE/MAX Southern Shores search page you can input specific criteria to search all of North Myrtle Beach or just Waterfall community to get an idea of the home styles, price ranges, and amenities that are available. Then, call RE/MAX Southern Shores at 843-249-5555 to speak with an agent, licensed in both North and South Carolina, who can find the home, vacation home, investment property, or lot that is RIGHT for you! Contact our office at 843-249-5555 where our agents will help you preview the properties that are currently for sale to find the right one! Call RE/MAX Southern Shores today at 843-249-5555 to explore all of the Little River area neighborhoods!